The Pre-Primary School Program at Mount Litera Zee School, Pune comprises Nursery, Lower and Upper Kindergarten (LKG and UKG). The ‘ILLUME’ curriculum focuses on the milestones in the area of cognitive, linguistic, creative, social and physical development. The learning design leads a child to inquire and seek answers. Questions become the order of the day causing thinking and creativity to be the norms. A variety of experiential activities are planned for delivering themes based concepts. Curriculum provides numerous exposures to nurture sensory and gross motor skills, and also small muscle and large muscle activities for physical development of children. To cater to educational needs of children, the school has multiple teaching aids like interesting audio – visual aids, interactive white board, various toys and games for cognitive development and a series of teaching material for introducing concept that build strong recognition among children. 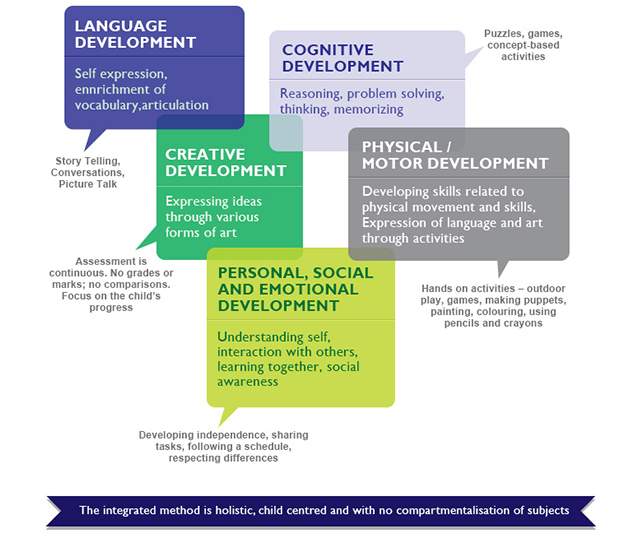 The integrated method is holistic, child centered with no compartmentalization of subjects. It seeks to give a complete experience to the child within the child’s range of experiences and understanding. This approach goes a long way towards shaping a whole some and healthy personality and prepares each child for primary school. A day at SCHOOL begins with Free play where the children are allowed to initiate and direct their own learning styles by choosing from a range of learning material and equipments displayed in the four corners of the class rooms. This is followed by Attendance and Assembly where the children learn to self-register through activities such as by printing their finger or sticking their picture next to their name. Children also discuss the previous day's activities and teacher tells them about the day's events. These involve activities based in the month's theme and are planned to meet the unique learning styles of the children. The facilitator may sing a rhyme with actions, show charts / flash cards, play a game, take the children for a walk outdoors or do an art activity to introduce and reinforce concepts. The revision will also provide a range of pathways for the children to explore. Children get an opportunity to develop various musical skills such as rhyme, pitch, tone and rhythm. It also allows the children to express themselves freely through the medium of music and movement. Good eating habits and independent eating skills are encouraged. Children develop their gross and fine muscles as well as learn various social skills such as sharing, taking turns, etc through Outdoor play / Sand play / Water play / field Trips etc. ‘Milestones’ is an observation based evaluation system and does not require the children to go through tests and exams. Milestones allows for children to develop at their own pace. It is continuous and includes parental inputs and anecdotal evidence. Children are assessed individually and the assessment is inclusive of the learning experience and understanding.